Mario Verga was a successful silk merchant born in Milan, Italy in 1910. In the late 1940s, he became a well-known Italian speedboat racer, competing in the 450 kg (992 lb) class. He left boat racing in 1950 when he married Liliana Burlazzi, but the pull of the sport was too strong for Verga to stay away. The Abbate-built Laura I was a sleek design. Aluminum bodywork covered the Alfa Romeo Typo 159 engine. Note the step between the sponson and the hull. 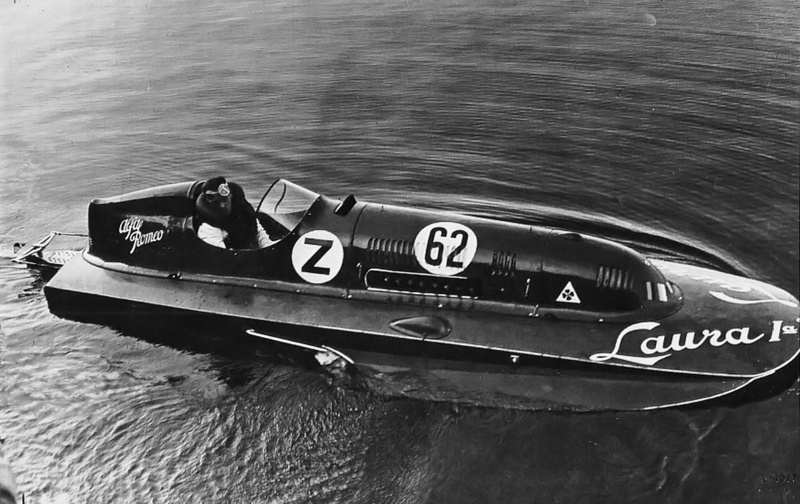 In 1952, Verga returned to the speedboat world with his 450 kg (992 lb) class Laura I racer. Named after Verga’s young daughter, the boat was built by Guido Abbate at Lake Como and was 17 ft 3 in (5.25 m) long and 7 ft 6 in (2.28 m) wide. The Laura I was powered by an Alfa Romeo Typo (Type) 159 engine, the same type of engine that propelled auto racing legends Nino Farina and Juan Manuel Fangio to respective Formula 1 World Championships in 1950 and 1951. The “a” after the number in the boat’s name designated the Alfa Romeo engine. Verga and the Laura I captured the 450 kg (992 lb) class championship in 1952. On 7 July 1952, and half the world away on Lake Washington’s East Channel near Mercer Island in the Pacific Northwest, Stanley Sayres and Elmer Leninschmidt set a new world absolute water speed record at 178.497 mph (287.263 km/h) in the three-point hydroplane Slo-mo-shun IV. Sayres, Ted Jones, and Slo-mo-shun IV had set the previous record at 160.323 mph (258.015 km/h) on 26 June 1950, the first post-World War II water speed record. For both records, Slo-mo-shun IV was powered by an Allison V-1710 engine. The Laura II used the same bodywork as the Laura I. However, the sponsons had no step between them and the hull, and the hull had larger fuel tanks. Note the engine’s eight exhaust stacks. Modifications to Laura I had increased the boat’s weight, and it fell within the 800 kg (1,764 lb) class. On 29 January 1953, Verga set an 800 kg (1,764 lb) class speed record of 125.670 mph (202.247 km/h) in Laura I. He increased the record to 140.737 mph (226.495 km/h) on 15 February 1953. Both records were set on Lake Lugano. Verga had a new 800 kg (1,764 lb) class boat built by Carlo Timossi at Lake Como. The new boat was named Laura II, and it was 17.5 ft (5.33 m) long and powered by the same Typo 159 engine that powered Laura I. Images indicate that the aluminum bodywork of Laura I was used on Laura II. Verga and the Laura II won the 800 kg (1,764 lb) class championship in Europe on October 1953 and then traveled to the United States. 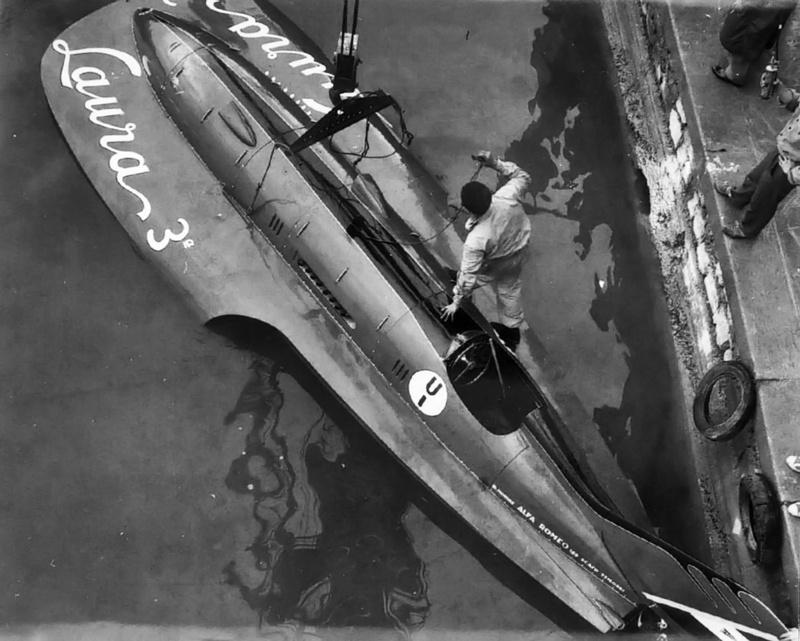 The Laura II won the Orange Bowl International Regatta Grand Prix held at Miami Beach, Florida in December 1953, and also set a speed record for the 151 cu in (2.47 L) hydroplane class, averaging 131.680 mph (211.919 km/h). 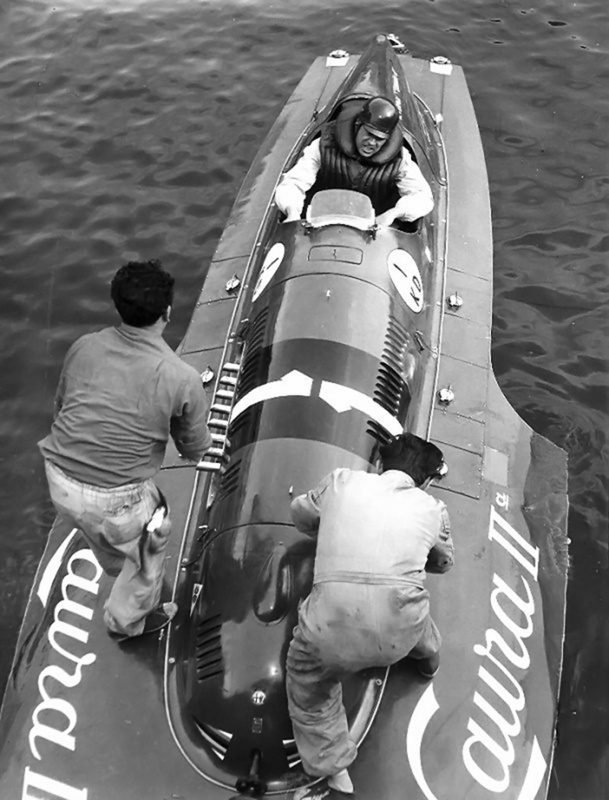 Verga’s speed records and the records of other Italian speedboat racers (Achille Castoldi averaged 150.188 mph / 241.704 km/h in the 800 kg class, Ferrari-powered Arno XI on 15 October 1953 at Lake Iseo) inspired the Italian Motornautical Federation to offer a £5,000,000 prize to the sportsman that surpassed Slo-mo-shun’s 178.497 mph (287.263 km/h) record. Stipulations for the prize were that the boat had to be made in Italy, powered by an Italian engine using Italian fuel, and driven by an Italian driver. Verga and a couple of other Italian racers accepted the challenge. However, the other contenders soon dropped out as complications were encountered. 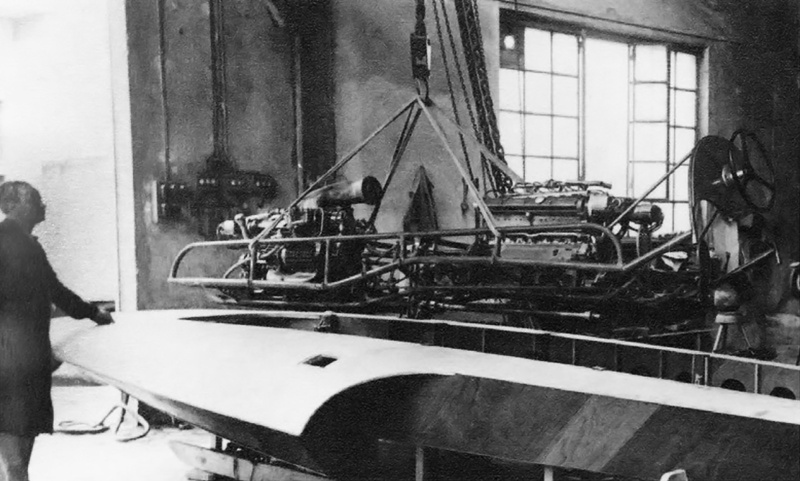 The two Typo 159 engines mounted in their frame, as the frame is installed in the Timossi-built Laura 3. The two-stage Roots-type supercharger can be seen on the front engine. Note the propeller shaft extending below the rear engine. For the water speed record challenge, Vega turned to Timossi for a specially-built boat, named Laura 3. Verga continued with the Typo 159 power plant but decided to use two of the engines. The Typo 159 design stemmed from the Alfa Romeo Typo 158, originally designed in 1937. Commonly called an Alfetta, for Little Alfa, the engine was a straight-eight that used a one-piece aluminum cylinder head and block mounted to a magnesium alloy crankcase. The cylinders had a 2.28 in (58 mm) bore and a 2.76 in (70 mm) stroke, making the engine’s total displacement 90 cu in (1.48 L). The Typo 159 employed a two-stage Roots-type supercharger that enabled the engine to produce an impressive 420 hp (313 kW) at 9,300 rpm. The two Typo 159 engines were positioned back-to-back, with a 2-into-1 gearbox positioned between the engines. Combined, the engines produced over 800 hp (597 kW). The gearbox increased input speed so that the propeller shaft turned at 1.133 times engine rpm. The engines and gearbox were mounted in a special, tubular-steel frame built by Alfa Romeo. 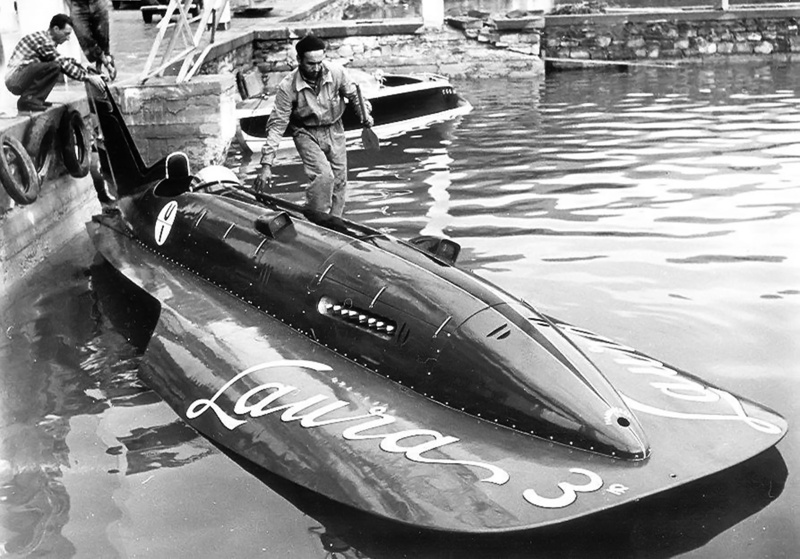 The wooden Laura 3 was a three-point hydroplane built around the steel power train frame, which was installed in the front of the boat. Aluminum body panels covered the engines and cockpit. Extending behind the cockpit was an aluminum tail that had a ground adjustable rudder for stability. The Laura 3 was 23 ft 7.5 in (7.20 m) long and 8 ft .5 in (2.45 m) wide. The boat weighed 2,028 lb (920 kg). The completed Laura 3 was an elegant hydroplane. Note the tail extending behind the cockpit. The rudder on the tail was ground-adjustable, and its angle could not be changed while the boat was in motion. 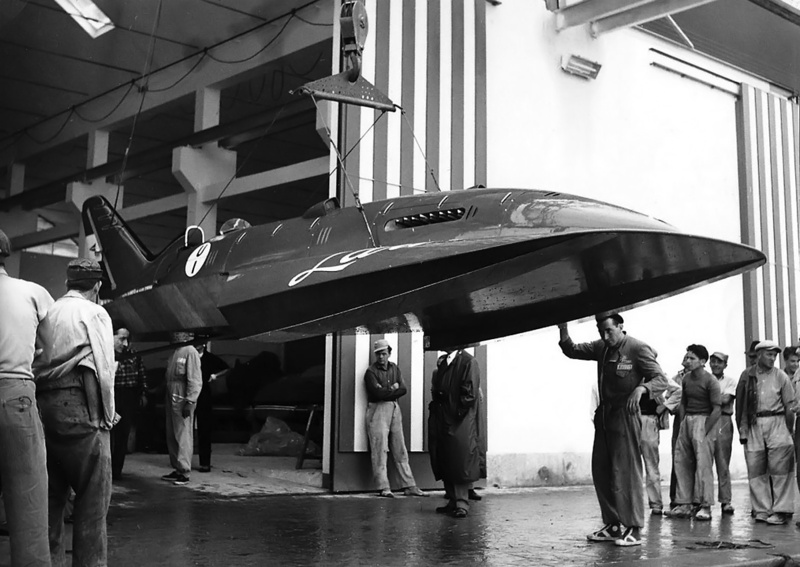 In July 1954, Verga and the Laura 3 made a series of test runs up to 100 mph (160 km/h) on Lake Pusiano. The boat was then moved to the larger Lake Iseo. The testing continued in August, and 165 mph (265 km/h) was reached. Verga made a record attempt on 28 August, hitting 170 mph (274 km/h), but a cooling issue was encountered that resulted in damage to one of the engines. Repairs were made, and testing resumed in September. At higher speeds, Verga fought against the boat’s tendency to pull to the left, but was unable to keep the Laura 3 traveling in a straight line. Efforts to correct the issue had been unsuccessful, and it was decided that modifications to the hull were needed before a record attempt could be made safely. Changes to both sponsons were made, and the boat was completed on 8 October. Although full testing of the modifications had not been conducted, Verga was confident that Laura 3 could break Slo-mo-shun IV’s record. On 9 October 1954, Verga had waited until midday for the Il Trvano wind to die down over Lake Iseo and settle its waters, but the wind persisted. Verga decided to make a run anyway. As Verga and the Laura 3 sped over Lake Iseo at a speed of approximately 190 mph (305 km/h), the boat hit a couple of small waves that raised its bow. At speed, the aerodynamic forces caught the bow and lifted the Laura 3 out of the water. The boat flipped and rolled before smashing back down into Lake Iseo and sinking. Verga was instantly killed in the crash, and the Laura 3 was destroyed. 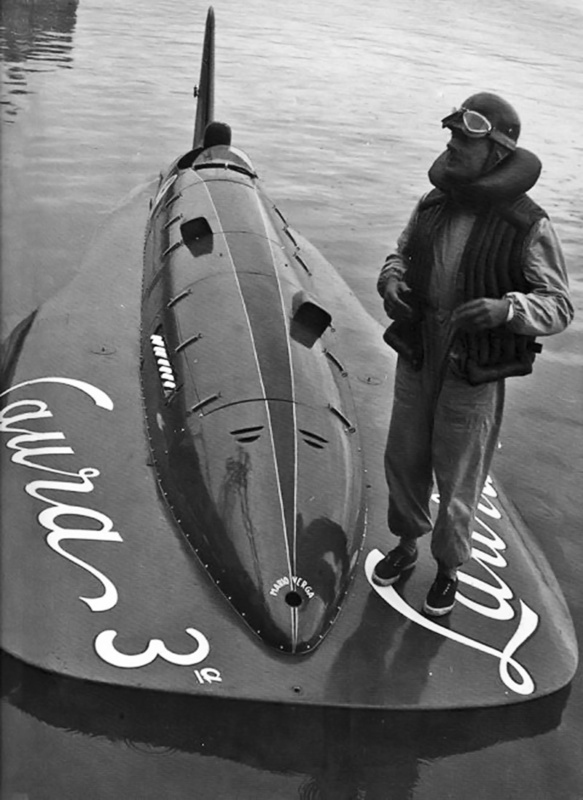 Verga’s run in the Laura 3 was the last time an Italian tried to set an absolute world water speed record. The beautiful Laura 3 sits ready for a test run. Note the individual induction scoops for the Typo 159 engines. In 2015, the Laura I was restored by Tullio Abbate, Guido’s son, with a non-original (2.5 L Alfa Romeo V-6) engine installed. The boat is on display at the Museo della Barca Lariana on Lake Como. The fate of the Laura II is not known. The tail of Laura 3 was salvaged and preserved. Note: As previously mentioned, the Laura I and Laura II used the same aluminum bodywork. The boats were very similar but had different sponsons. Some sources state that Laura II set the 800 kg record in 1953. However, newsreel footage and the museum housing the preserved Laura I credit the Laura I with the record. Mario Verga prepares to make a run in Laura 3. Note the “Mario Verga” text on the front of the boat. This entry was posted in Marine on 5 February 2019 by William Pearce. Crazy brave man. Two of those motors at full blast must have been fearsome/glorious. Such a dangerous record to attempt, quite a few landspeed luminaries came to grief on the water. Thanks Mr Pearce, love the reciprocating engine insights, would love you to analyse my favourites the Napier sabre (especially the intricacies of the sleeve valve operation) and the incredible Nomad and Deltic. I own a deltic con-rod useful to repel a home invasion! Glad you liked the article. The Sabre, Nomad, and Deltic are all on the wish list. They are just big subjects to cover. Especially the nomad ! Napier certainly ended up overelaborating on that one. Had the perverse result that uk ended up running RR Griffons in the Avro Shackleton well into latter 20th c. Nomad would’ve given the beast plenty of “loiter time” especially if they’d simplified it with a few big turbochargers. Whether it would have mitigated the Shackleton crew’s notorious hearing problems in later life is another question. Though apparently Tupolev Bear crews had it even worse!